Sitting within its own grounds and surrounded by lush, green countryside, the Mountaintop Retreat really lives up to its name. This incredible timber home, with a huge soaring roof covering two stories, fits seamlessly into its environment – living at one with nature has never looked better! 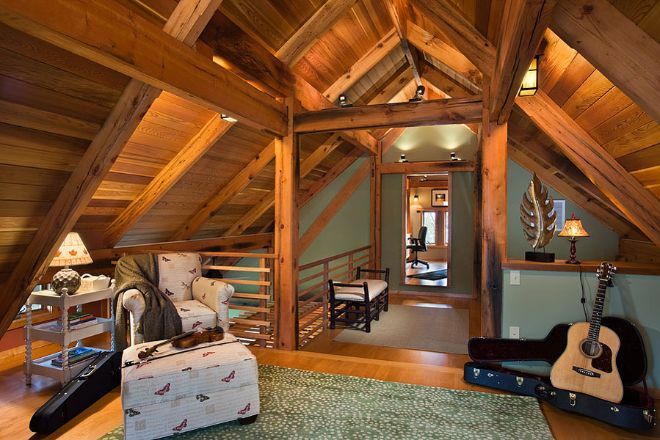 Don’t you love how rooms have been built into the sloping roof, and how the house has an almost symmetrical feel to it? Stepping inside, you’re struck by the huge, open-plan ground floor of this exquisite timber retreat. The Great Room has beamed ceilings throughout, which give the room character, and the large windows and glass doors stretching across the side of the house provide us with fabulous views. While the living, dining room, and kitchen are fully open-plan, the clever use of traditional rugs delightfully divides the room up. 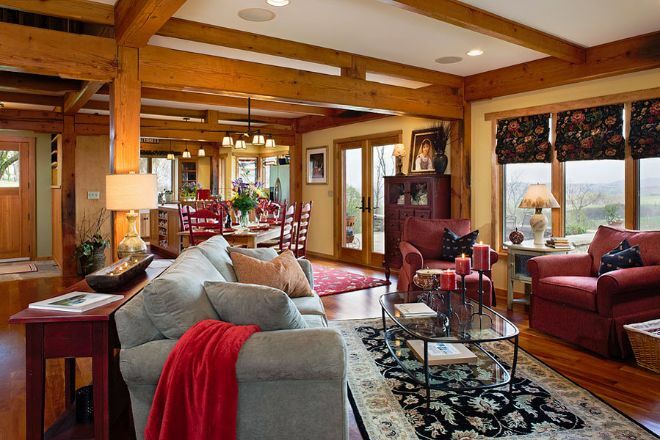 Despite the large size of the ground floor, the living area manages to be particularly warm and cozy. This is partly due to the excellent choice of rustic furniture for this home, but also because of the way in which the comfortable sofas have been arranged around the striking brick wall and fireplace. Breaking up the living room from the kitchen is this wonderful space for dining. Attention to detail in terms of design can be seen throughout this classic timber home, and the dining area is no different. Look how perfectly the patio doors are located to allow access to the outdoor space – a great option for eating al-fresco on those hotter days. Could a kitchen get any better than this? 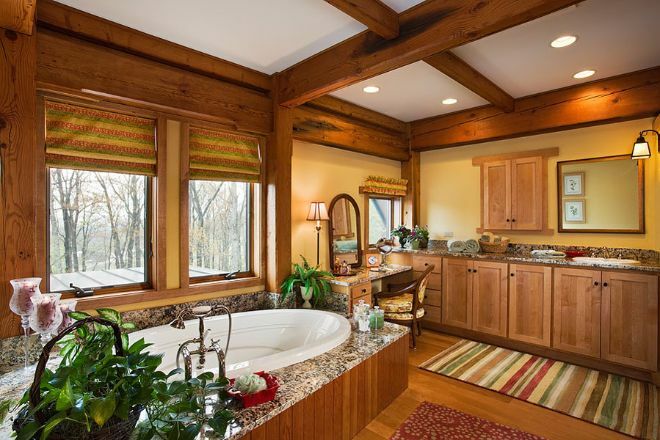 The top-quality matching cupboards and countertops blend perfectly with the beautiful wooden polished floors. 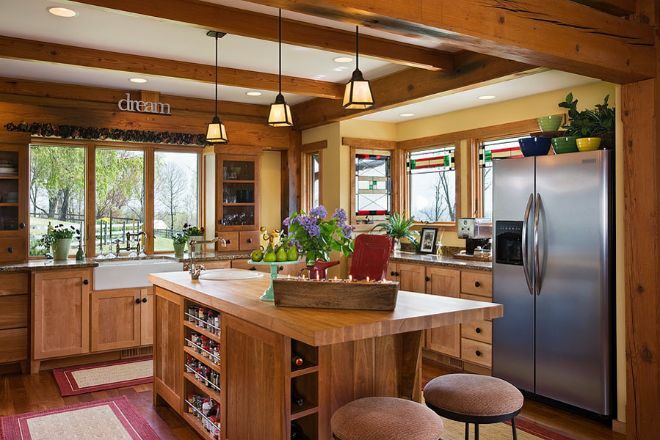 There is an abundance of storage and preparation space with the wonderful island also doubling as a small breakfast bar. This superb kitchen blends old-fashioned classic with modern comforts – just look at that dropped sink and the detail of the window design! As this is a three-story abode, the staircase is an important part of the house structure, and the Mountaintop Retreat manages to make it a real central point. The wonderful craftsmanship and detail is astounding. 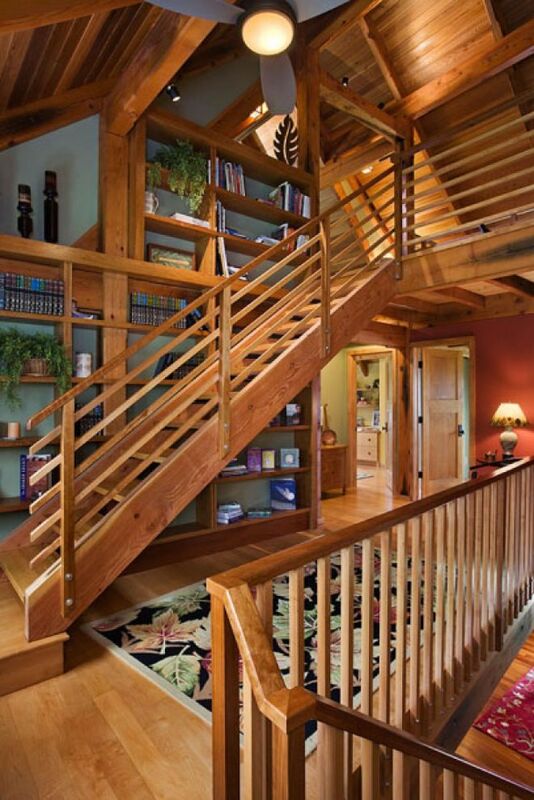 We love how extra storage has been built within the wall structure around the staircase, utilizing all available space – wonderful! 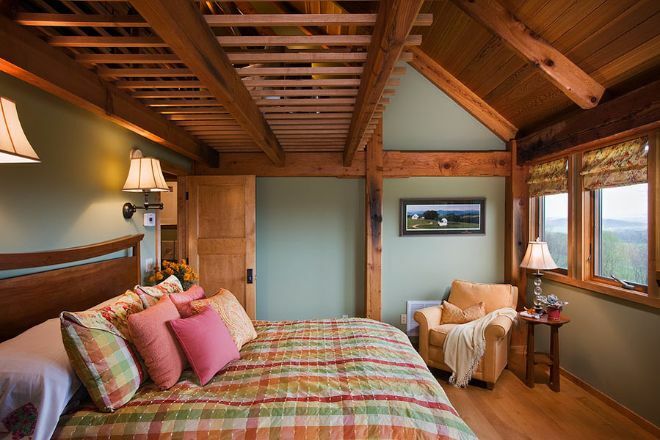 All the bedrooms in this amazing timber home are a good size, but the master bedroom really is a must-see. 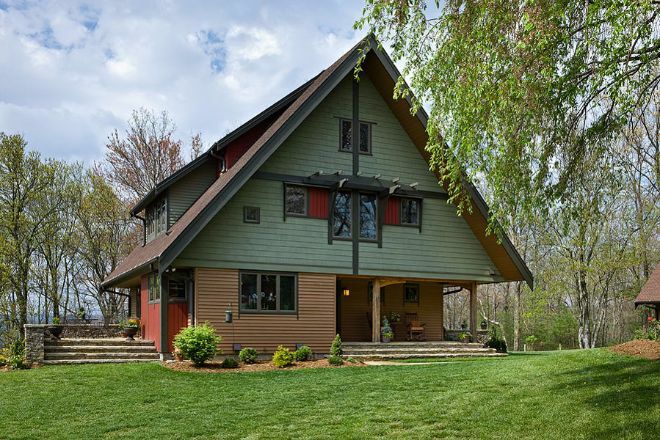 Up on the second floor, you can see how the archetypal triangular roof creates a contrast to the lower level rooms. 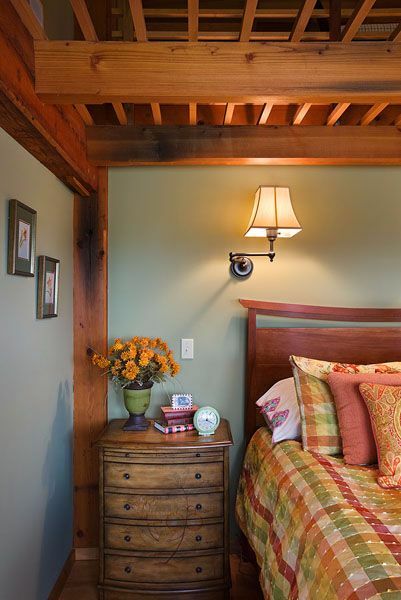 It’s incredible how creative the design of this house is – the room has a warm, comfy atmosphere despite the high ceilings due to the addition of lower panels above the bed. We also love the refurbished furniture! As we’ve seen throughout this tour, there is continuity in decoration in all rooms of the house. 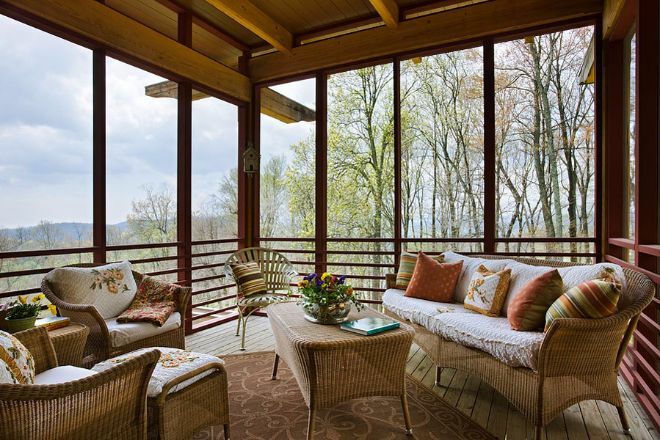 Never losing the traditional style of a classic timber house, the Mountaintop Retreat encompasses modern living for nature lovers. With the same large windows to let in light and plenty of cupboard space, we can just imagine ourselves having a soak in that built-in bathtub surrounded by scented candles. Up at the top of the house is an enormous open-plan loft space. Although there is a slanting roof, the room seems open, and there is plenty of room to walk around. 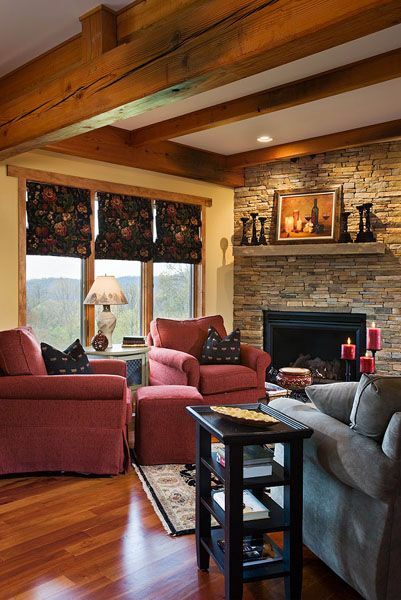 As you can see, the upper floor has various sections, one of which is used as another area to sit back and relax. There’s even a study at the far end to do some work if you can tear yourself away from the views! And finally, our tour takes us back to the fresh outdoors. 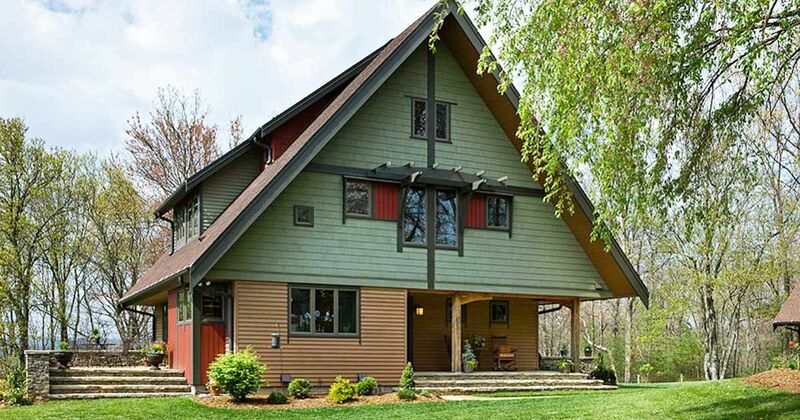 This home wouldn’t be complete without a covered porch to enjoy on warmer nights. A good size for family gatherings, this terrace stands raised at the back of the house. 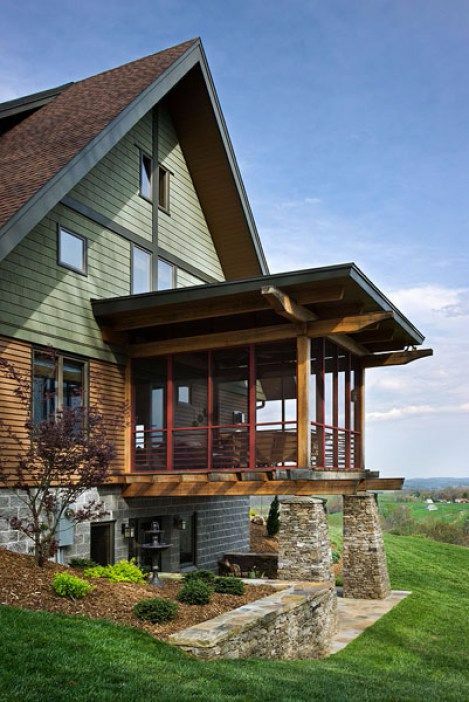 A perfect porch for a perfect timber home. 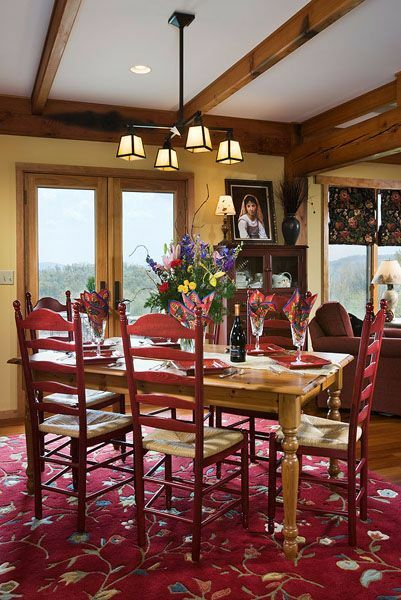 If you enjoyed your tour of the Mountaintop Retreat, LIKE and SHARE on Facebook!